Just a quick note of a memory nearly lost. 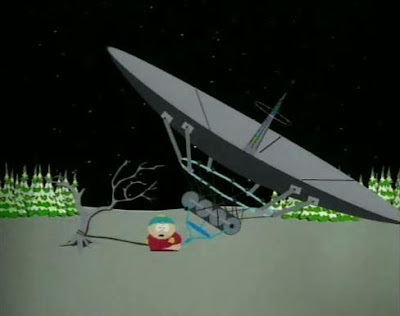 A South Park episode came on TV tonight from 1997. Thirteen years ago. I remember going over to Chris Saich's double wide trailer in college to watch this new show with a small crowd. Come to find out later that this was a practice followed all across the country in colleges, but in the quasi pre internet age, we didn't know. It was just something different, funny and new. Quasi-Pre-Internet. Can I copyright that? Anyway, a nice treat. I hadn't seen that episode or much of any South Park really since that summer 13 years. It's interesting that now I see an ad for the 200th episode. Wow, Matt and Trey stuck with it. Hats off to them. And hats off to Baseketball. Did I just say that? Yes I did. South Park was different at the time. Many copycats later, it's still here. I have to say, while I'm sure something else will come along that gets college kids together at 10pm on a Wednesday night, you can't really deny that South Park really did something creatively remarkable. "Basically ... out of all the ridiculous religion stories which are greatly, wonderfully ridiculous — the silliest one I've ever heard is, 'Yeah ... there's this big giant universe and it's expanding, it's all gonna collapse on itself and we're all just here just 'cause ... just 'cause'. That, to me, is the most ridiculous explanation ever." Good stuff. And well done Matt Stone and Trey Parker. 200 episodes of cartoon vulgarity and with that has yet to be matched. An endurance run that I respect. "I know a certain kitty that's sleeping with mommy tonight."